Once again there’s more for them and less for us. The imbalance between the pay of CEOs and working people continues to increase. 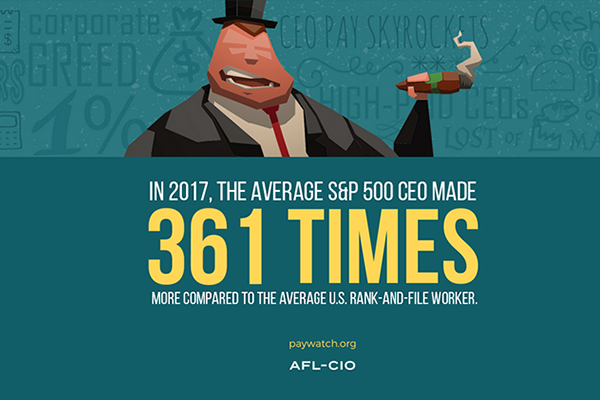 In 2017, CEO pay at S&P 500 Index companies increased to an average of nearly $14 million while production and nonsupervisory workers received on average just $38,613. The AFL-CIO recently released its annual CEO-to-worker pay report: Executive Paywatch. The report not only exposes the gap in earnings but it shows which companies are investing in their workforce to create high-wage jobs. It also indicates which companies pay their CEOs reasonably relative to other employees.